"The higher quality hay you have, the more milk you're gonna get." The highest quality hay is an important factor in the health of cows, horses and all livestock. The Juice is an industry leading buffered propionic & citric acid hay preservative with active ingredients that deliver superior results. Hay bales treated with The Juice stay fresh longer, maintain their green colour and retain valuable nutrients. Additionally, The Juice allows you to bale at a higher moisture level, effectively extending your baling window. Made in Canada by Nuhn Forage Inc., The Juice buffered propionic acid uses a unique dispersing agent to ensure even application and quality. Dispersing throughout the hay to find moisture, The Juice penetrates the entire hay stem. To indicate which products you'd like to order. Check off the desired product and enter quantities in the line below. Please Specify the quantity you would like to purchase. Thank you for contacting Nuhn Forage about requesting an order of The Juice. One of our representatives will contact you to confirm your order request details. If you don’t hear from us, please call Nuhn Forage at 1-800-965-9127. Bulk liquid is also available upon request. Hay treated with The Juice will retain a nice green colour during storage, providing hay producers with a more marketable product. The Juice penetrates the entire hay stem, giving bales a consistent coverage. When hay is not properly treated, mold will often grow in the bale. This causes the hay to become discoloured and loose it’s freshness. 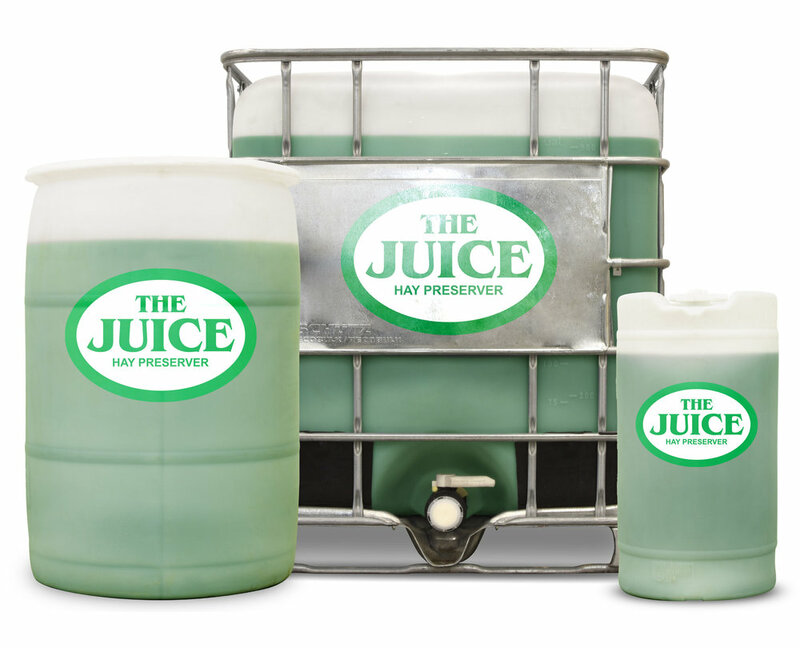 The Juice protects bales, keeping your hay fresh and free of harmful mould and dust. Treating hay with The Juice will increase the feed value of your hay by retaining the nutrient filled leaves. Treated hay retains a higher percentage of dry matter per bale versus hay that is not treated with The Juice. The active ingredients in The Juice allow hay producers to safely bale hay at a higher moisture level without the risk of spoilage or heating. Baling at a higher moisture will extend your baling time and reduce your drying time. 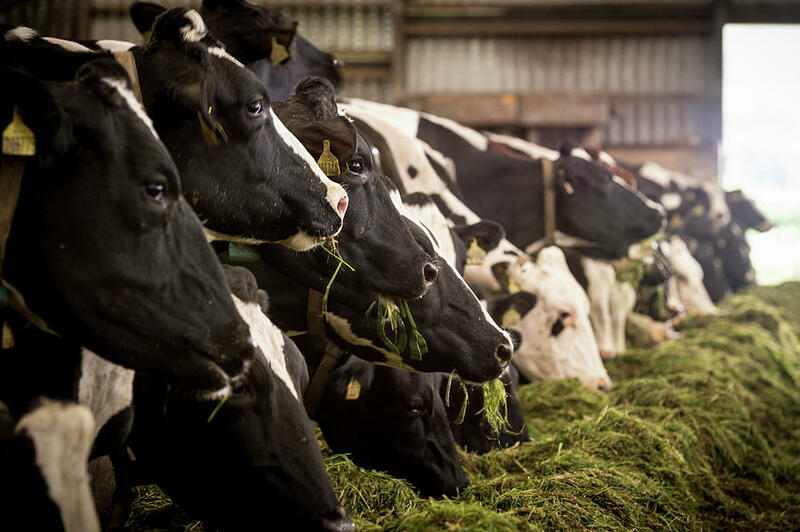 Feeding dairy cows a high-quality hay results in greater feed intake and, as a result, dairy cows produce more milk. Using The Juice helps bales maintain their leaves, increasing the feed value of the hay. The juice also reduces the risk of mouldy hay which can cause illness in dairy cows. Certain mould can even increase the risk of mycotic abortions. Studies have proven that treated hay is not only safe for horses, but the propionic acid in The Juice increases the energy value of the hay. Using The Juice reduces mould growth during hay's cure down period. Mould and dust decreases the feed value of hay and can cause respiratory issues in susceptible horses. Feeding beef cattle, sheep or other livestock hay that has been treated with The Juice can provide many benefits to livestock producers. Untreated hay can often grow harmful mould spores. Feeding mouldy hay to livestock can often result in illness, respiratory issues or digestive problems. Added directly to your mix, The Juice is a proven mould inhibitor for total mixed rations (TMR). With a high level of active ingredients such as buffered propionic acid, citric acid and exclusive dispersing agents, The Juice reduces nutrient loss and heating while prolonging the "bunk life" of mixed feed. Straw treated with The Juice puts the power back in growers hands. It gives added insurance for top quality return for your forage. 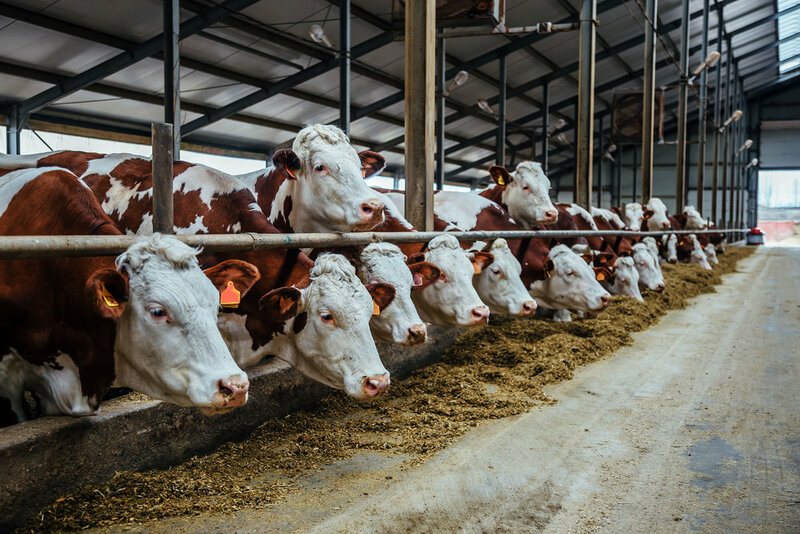 At the same time, livestock owners have one less thing to stress over as their bedding material is kept at peak performance. A proper environment encourages healthy livestock and maximum potential. 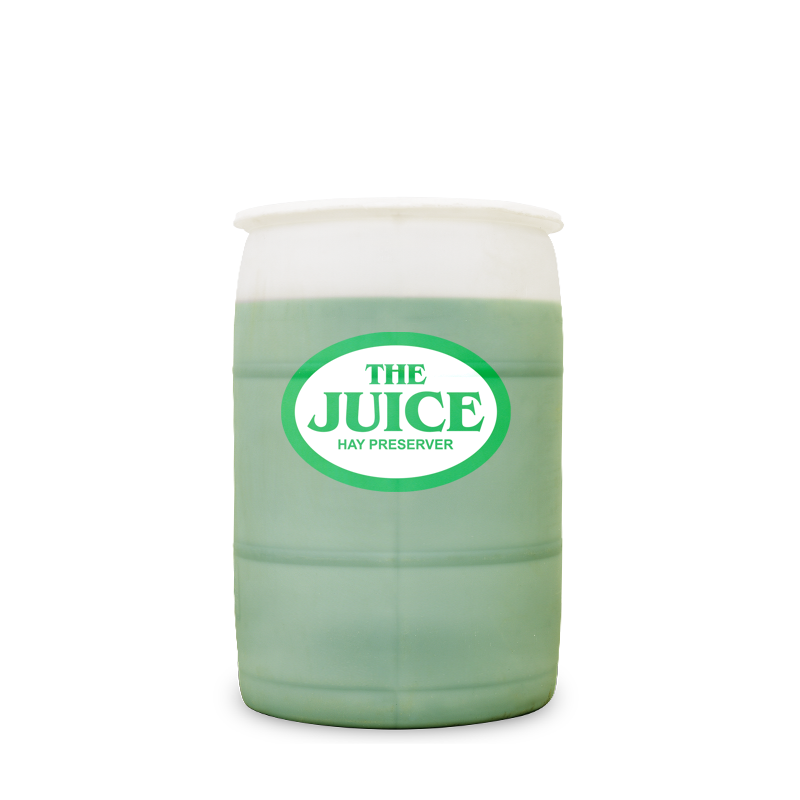 The Juice is the most effective acid forage preservative on the market. Some producers add straw to their total mix ration (TMR) as an additional source of fibre. When you treat your straw with The Juice, you prevent the risk of harmful mould and bacteria spores contaminating your TMR rations. Straw is also the most common bedding material for a large variety of livestock. The risk with untreated straw is that it’s quite prone to the growth of mould spores. These spores can then be released into the air as dust, which can affect livestock and also farmers. One of the more common forms of mould is known as Aspergillus. This particular mould can be very harmful to animals, often causing disease and respiratory issues. There are over 100 known strains of Aspergillus fungi. Among these, Aspergillus fumigatus, Aspergillus flavus and Aspergillus niger are the most common. All of these can cause many harmful symptoms and have been linked to a number of chronic and acute diseases in livestock. The strain Aspergillus Fumigatus is especially dangerous to horses. When inhaled into a horses lungs, the fungal spores invade the tissue in the upper air ways, causing respiratory problems. Straw that is properly treated with The Juice generates less dust and is less likely to grow harmful mould. Dust can be a significant problem in straw especially when used for livestock bedding. Dust can carry mould spores and bacteria that can be harmful to animals and their owners. When applied to straw, The Juice reduces the number of airborne dust particles. Farmers Lung is a common name for the damaging respiratory effects of dust inhalation. Dust exposure can cause chronic symptoms in farmers that are similar to asthma. If dust particles are not removed removed from the lung, serious long term effects on the respiratory system can result. The Juice is a great tool to keep your work place safe for both you, and your animals.